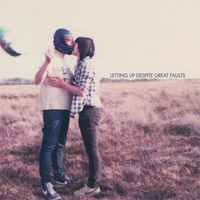 Letting Up Despite Great Faults’ 2009 self-titled release plops itself down quietly between the Postal Service and the Radio Dept. Like Dntel, the band produces pleasingly Tinkertoy-simple beats, promptly submerged in Radio Dept.-like shimmering dream-pop fuzz. The songs are spotless and beautiful, polished to a bright sheen. Too bright, in fact — perhaps less confident in his voice than his laptop, frontman Michael Lee sings in a dispassionate Elliott Smith-on-Xanax whisper, and the songs lack the cartoonish punch of the Postal Service or the Radio Dept.’s unrequited angst. Letting Up Despite Great Faults has crafted the sound of surrender; it’s an admirable effort, but one can’t help wanting to hear him fight back when the bell rings for the next round.